Do you have dinosaur obsessed kids? Have they ever wanted to hatch their own dinosaur? 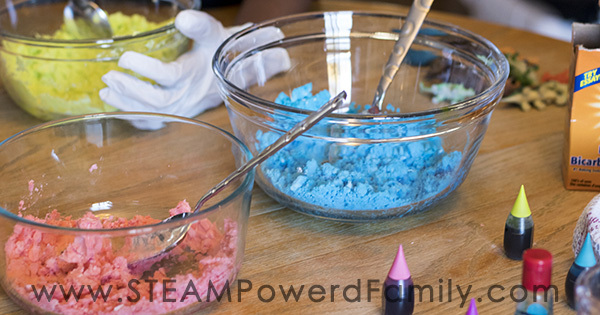 Last week we did just that using a little science, chemistry to be exact. It was so much fun the kids keep begging to do it again. 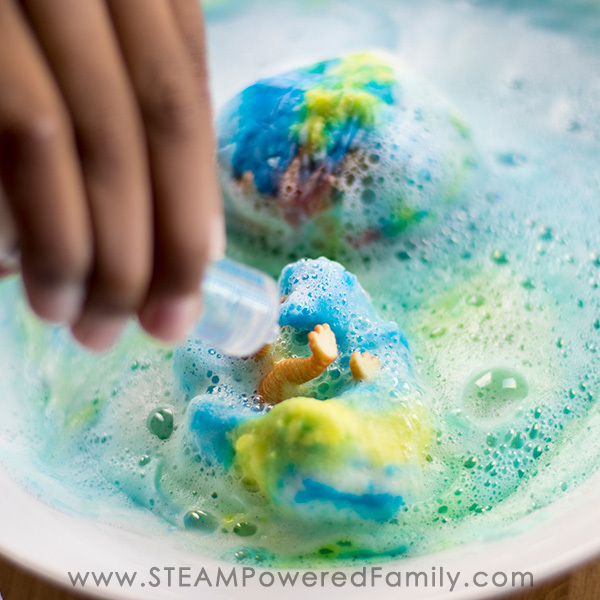 This activity is great for all ages and abilities, even adults get involved in the science fun! Last week we hosted a family reunion and as the host I knew I had to come up with some activities to keep the kids entertained. I had all boys from 3 to 10 years old and for a while I struggled to come up with something that would work for everyone. Finally the answer came to me, hatch dinosaur eggs! And it was a HUGE hit! Check out our dino egg hatching in this video. The kids went nuts! All the kids were able to participate. They just need to be old enough to use a medicine syringe without squirting themselves. For the younger guys this was some great fine motor strengthening. Seeing the chemical reaction was a hit with all ages and even the adults got all excited as we could see bits of our dinosaurs coming out. My boys especially loved trying to guess what type of dinosaur it was while it was slowly being revealed. 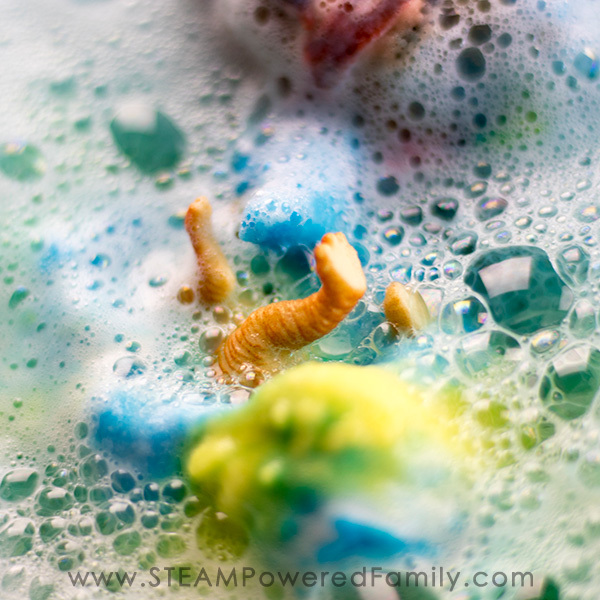 Once hatched the boys gave the dinosaurs a little extra cleaning. And the colours! Oh it was sooooo beautiful to see how they are swirled together, changing and blending throughout the hatching. 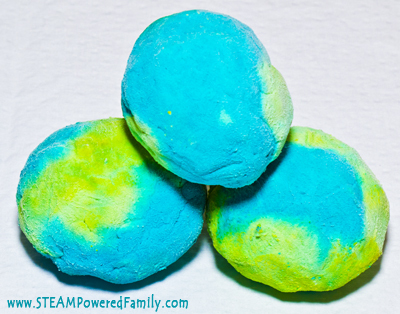 This activity would be great at a party (what a way to get a nice keepsake from the party! ), in a classroom, as part of a science experiment or even a dinosaur unit study. So many fun applications. I also think you could create some gorgeous imprint art if you carefully laid some canvas over the bin once the eggs were all hatched. 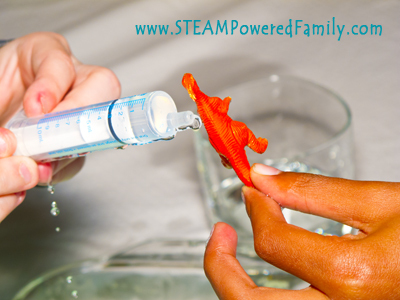 What to do – Chemistry fun with a Dino Twist! The first step is to colour your baking soda. I found one box of baking soda made approximately 3 eggs, depending on the size of your dinosaur. Simply add your drops of colour and carefully mix. I highly recommend you use gloves. I didn’t the first time and my hands were dyed for two days. Once the baking soda is coloured carefully added some water. For one box of baking soda I used approximately 1/4 cup of water. Add it slowly and mix thoroughly before adding more. You want it to just start to become paste like so it will stick together. I liked making multiple batches of different colours so we could make our eggs multiple colours. For some extra fun, hide one colour in the middle with a different colour on the outside. Another trick is to add sparkles or glitter to the middle so they are released during the experiment as your dinosaur is coming out. The combination of new colours, glitter AND a dino baby really gets the kids excited! Take a palmful of the paste and squish it about to make a ball. Press in a dinosaur. Then add more paste to the top and sides until the entire dinosaur is encased. Place on parchment paper on a cookie sheet and set in the freezer. Freezing helps to set the baking soda dinosaur eggs. I actually dropped one after it was frozen and it didn’t break. Perfect for little hands that want to explore the eggs before they start hatching. They freeze very quickly and are ready within an hour, or leave them in overnight. 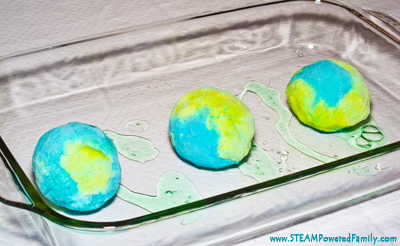 When you are ready for the big hatching, set the baking soda dinosaur eggs in a large dish. I liked using a casserole dish so you could see from all sides, but any dish will work. Dribble some dish soap on the bottom of the bowl. Pour some vinegar in a cup or bowl and give the kids each a syringe. 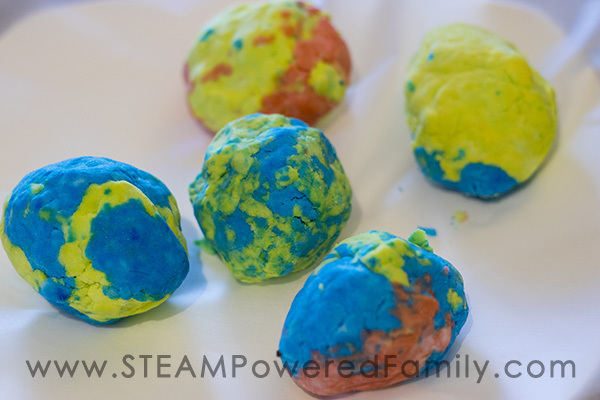 Squirt your baking soda dinosaur eggs to start them hatching! The reaction is a simple baking soda and vinegar reaction, much like our bottle rockets, but this was a different way to explore that reaction. Plus, it’s fun! – Wear rubber gloves when making the eggs or you will colour your hands! See my Instagram for proof. – You may wish to have the kids wear safety glasses depending on their age and competence with the syringe, vinegar in the eyes is not fun. – If you or any of the kids have hangnails or any cuts to their fingers, consider rubber gloves, that vinegar stings! – This can be a messy activity! Prepare the area appropriately. 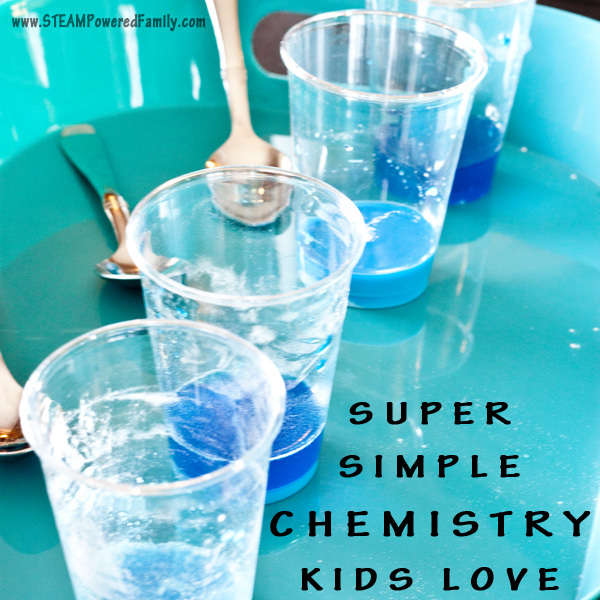 This activity explores the popular baking soda and vinegar reaction. 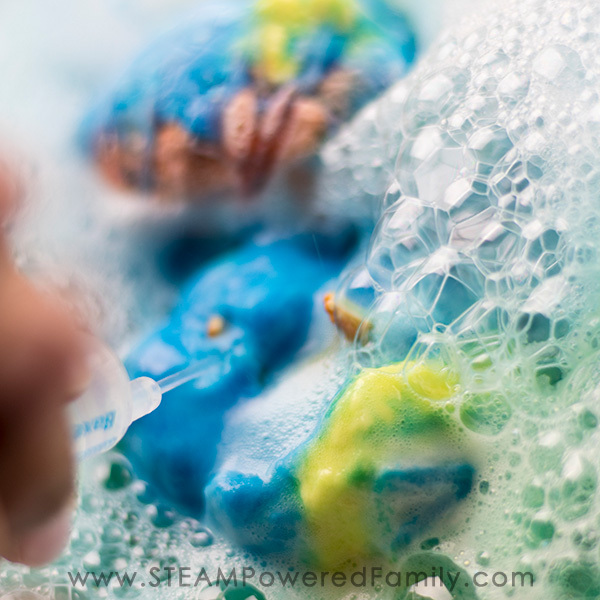 During this chemical reaction, the vinegar reactions with the baking soda. Vinegar or Acetic Acid has the chemical formula CH3COOH. Baking soda is a base also known as Sodium Bicarbonate and has the chemical formula NaHCO3. During this reaction the products are sodium acetate (NaC2H3O2). Sodium acetate is made of 1 sodium ion, 2 carbon atoms, 3 hydrogen atoms, and 2 oxygen atoms. The other products are water (H2O) and carbon dioxide (CO2). Carbon dioxide is the gas that causes the bubbling during the reaction. Why not use a digital thermometer to test if the reaction is exothermic or endothermic? Use candy or a chemistry model set to build and demonstrate the chemical reaction that is taking place. 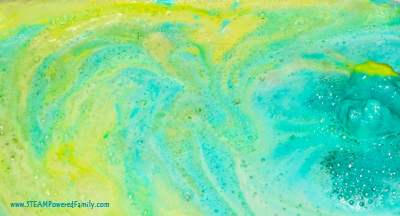 Use canvas placed gently on top of the beautiful resulting liquid to create gorgeous art! 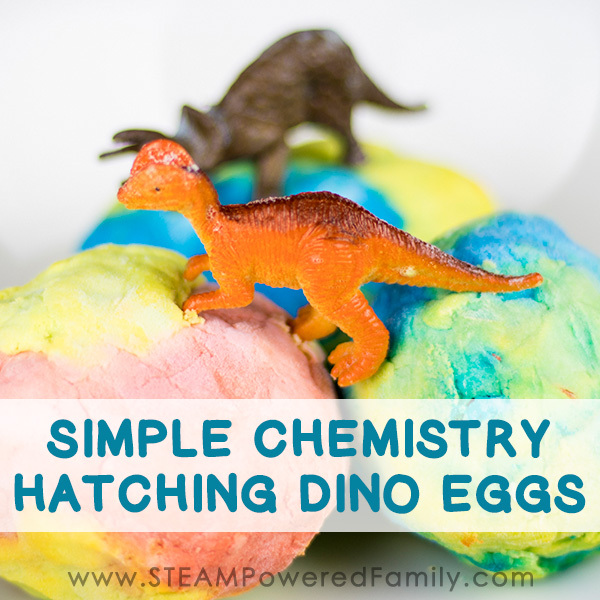 Ready For New Dino Eggs Chemistry? 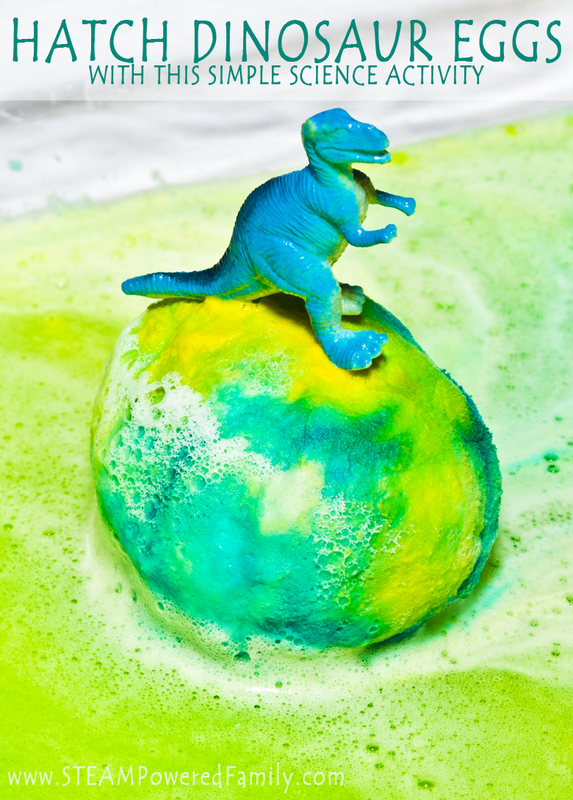 Don’t Miss Dinosaur Bath Bombs! 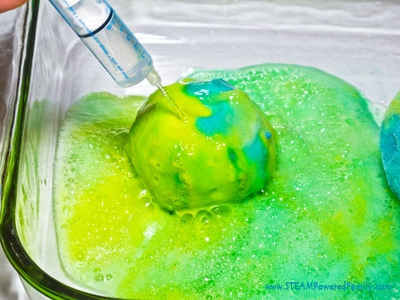 You love this activity so much, we created a new version that kids are going crazy over! 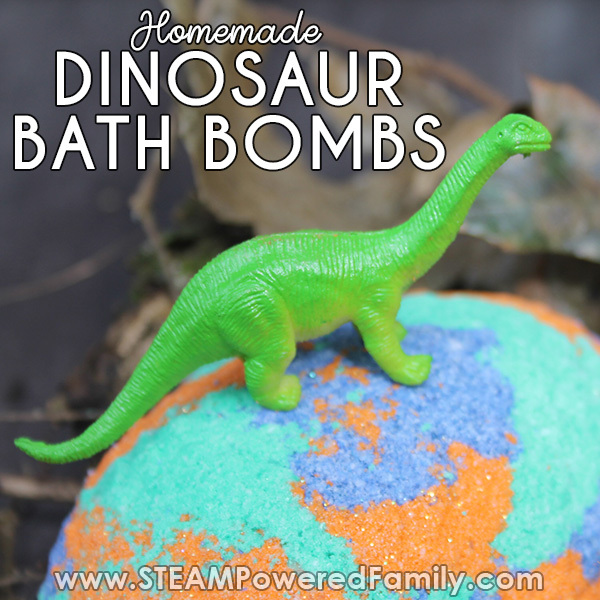 Dinosaur Bath Bombs. 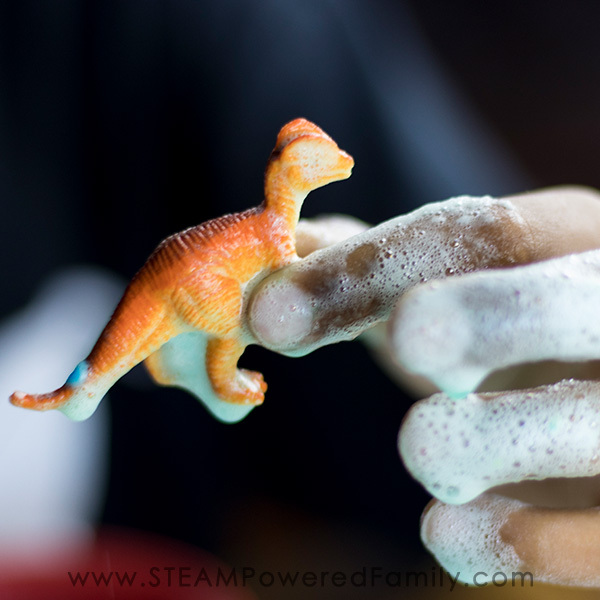 This DIY project teaches more advanced chemistry and kids love taking their Dino Eggs into the bath tub and hatching their baby dinosaur. 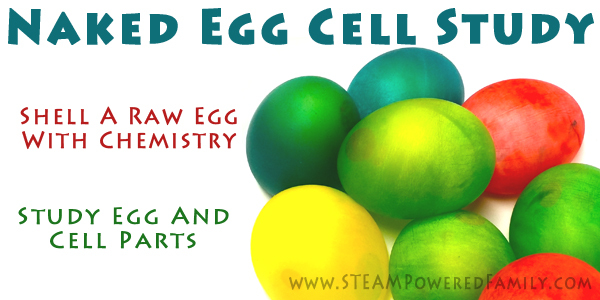 A fantastic follow up activity to this one with a more advanced chemistry lesson. This is so cool! We are going to have to do this one at school. The kids will LOVE it! 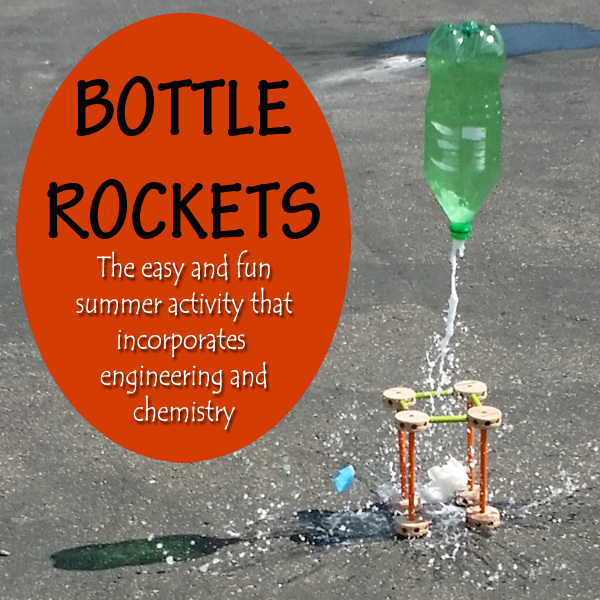 What a fun STEM activity! My children would love it! Thank you for sharing at the #Made4Kids Link Party! I dyed baking soda black once to made dirt and my hands were black for a few days. My son is constantly taking my baking soda and vinegar to his science experiments. He would enjoy this one. Thanks for sharing at Made for Kids! How much vinegar did it take to dissolve one Dino egg? We are doing a school-wide project! It is about 1/3 of a cup depending on the size of the egg and how “enthusiastic” the kids are. I’d love to see pictures. Tag me on social media if you do this. I was thinking about doing this just one question what size box of baking soda did you use. Good question! I’ve noticed that the box sizes vary based on where you are in the world (or if you have Costco in your neck of the woods… their boxes are HUGE!). So it’s hard to give you an answer. It also varies based on the size of your dinos and how big you make your eggs. My best tip is to aim for about a cup per egg if you have the tiny dinos, but have extra available just in case. Just did this experiment and my 4 yr old loved it. He even helped make the eggs. A bit messy, but he loved it. We used a few mini dinosaurs and a few mini PAW Patrol figures…added mystery as to what we would find in the eggs. One question, what is the purpose of the dish soap in the tray? Thank you for sharing this! I am a speech-language pathologist and have a kiddo that I see 2x a week, on Mondays and Wednesdays. I am planning to make the eggs tomorrow and hatch them on Wednesday. I am worried that they will be too frozen if I keep them in the freezer this long. Will they still dissolve if they stay in the freezer for 48 hours? You are all good, you can’t over freeze them. If you let them thaw too much they may start to fall apart, so don’t let them thaw too much. I have some that have been in my freezer for a couple of months, ready for any surprise playdates! 🙂 Have fun! Hi, is it possble to do this without freezing the eggs? I want the children to make them themselves but we don’t have a freezer on campus. If you don’t freeze them it won’t be “egg-like”, essentially you will have a baking soda paste around the dinosaurs. It will still erupt, but you will lose the egg quality of the activity.